Daniel Karasik’s debut story collection opens with a taut chamber piece that barely fills five pages, and closes with a story – spanning 80 pages, multiple narrators, and several decades – that could easily be branded a novella. Both concern the ravages of time on the human heart and the invincibility of hunger for love regardless of conditions. Here and elsewhere in this collection, Karasik demonstrates vigour, wit, and ambition. That arresting opener is aptly titled “Mine.” It is at once a story of possession, a bold exercise in brevity, and the staking of a claim for its author. The story delivers a bracing twist on dementia via prose that is ferociously polished, if a little overwrought. By contrast, “Witness,” winner of the Jack Hodgins Founders’ Award for Fiction, is steeped in irony. The story deploys oneiric, Kafkaesque scenarios involving animals, violence, and inexplicable incarceration as a way of exploring an aspiring writer’s existential crisis. The story witnesses little outside the perimeters of the narrator’s anxiety. In the excellent “A Much-Loved Teacher,” a young man mistakes an accident victim for one of his former teachers; he contacts the teacher and finds himself submitting to an intimacy he considers instantly uncomfortable. The story is very good at dramatizing the way some people carry a veneer of mystery no matter how transparent they try to be, while others project a friendliness that disguises a deep-seated unease with social contracts. 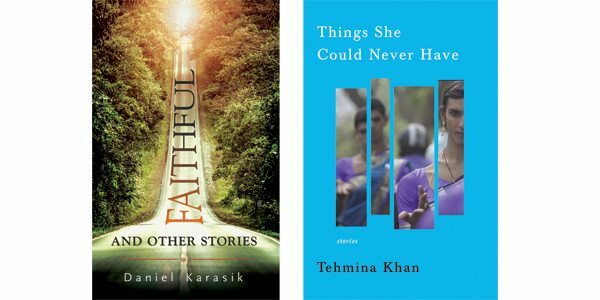 Faithful’s strongest selection is its title story, which seems to aspire to Alice Munro territory, leaping across swaths of time and lighting upon hinges in the trajectory of a strange, unmoored existence. There are missteps: Karasik makes the curious choice to combine third-person and first-person narration, there’s a precarious tendency to use mentally ill women as plot devices, and not every turn is believable. But there are moments – a reunion with an estranged brother; instances of connection between a woman and the adolescent sibling she’s just met – that are hushed and exquisitely knotty. Some stories wither in the heat of Karasik’s enthusiasm for effects. Others – the ones that breathe, whose investment in character equals their investment in sentences – suggest that Karasik, already established as a poet and playwright, likely has a strong novel in him, so long as his tendency to lean on a certain urbane, privileged milieu doesn’t constrain his formidable imagination. One thing that can be said for most of the stories in Faithful is that they surprise. The characters surprise themselves (and us); their circumstances challenge them (and us); no story begins in a way that makes the outcome feel determined or schematic. This cannot be said for the stories in Tehmina Khan’s debut collection, Things She Could Never Have, which are mostly set in the author’s native Pakistan. Khan’s characters are too often neatly divided into victims and victimizers; character development typically begins and ends with indications of one’s marginalized status, whether that be a matter of gender, class, or sexuality. Khan’s stories strive to grapple with some of the most urgent issues of our time, such as young people who are drawn toward radical Islam and terror. However, this ambition isn’t accompanied by any fresh insights into the psychology of radicalization, and several stories feature suicide bombings that do little more than inject easy drama. What resonates far more are the stories in which Khan considers less overtly fraught crises. “The First” is an evocative portrait of complicated female friendship, while in “Closed Doors,” a young couple measures the effect of their first pregnancy on their professional lives and family dynamics. The story ends with a gesture toward renewed understanding that’s elegant and understated. While too many stories in Things She Could Never Have simply confirm static notions about power and fairness, some, like “Closed Doors,” show a sober belief in an individual’s capacity for change, however small the change may be. The weaker stories serve as a reminder that acknowledgement is not the same as empathy; anyone can write a story about, say, a transgendered character in a hostile environment, but to honour that character means imbuing them with complexity and challenging received assumptions.